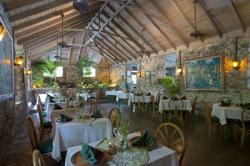 Sugar Mill is located on two acres in Little Apple Bay, across a small country road from the ocean. 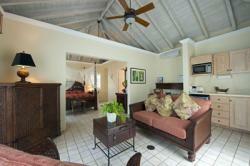 All rooms face the ocean with scenic views of Jost Van Dyke. 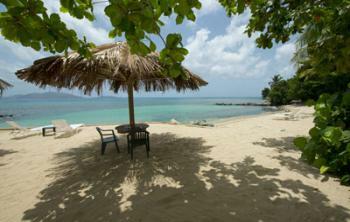 A small number of rooms and suites are nestled among the swaying palm trees assuring guests of a relaxing and quiet environment. 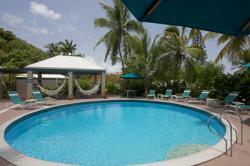 Our small beach, beachside restaurant and quaint swimming pool comprise the remainder of the estate. Full concierge services from our outstanding staff are available, as is wireless Internet. Kitchenette in each room, including mini-fridge, microwave, toaster and coffee maker; safe in hotel office for valuable storage, hair-dryers, ceiling fans, A/C, full concierge service, Sugar Mill Restaurant, Islands Beach Bar, outdoor stone showers on some rooms, cable TV in suites.